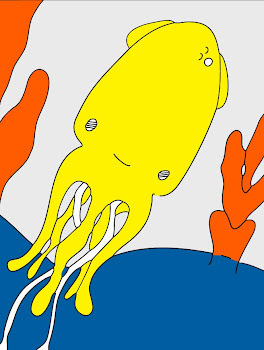 Technicolor Squid: The Science Of Sleep. Hello wonderful, beautiful people. Well, The Science of Sleep was fabulous (trailer below). We saw a late showing at The Egyptian after a lovely, long dinner. This movie really struck a cord with me because I don't sleep well and my dreams cause a lot of emotional turmoil. I have always suffered from extremely, extremely vivid dreams. Ah well, I am tired (and well prepared for dreamland) tonight that is for sure! I know. I know. I have become a YouTube junkie. I can not help it, I love showing you videos. I hope you all had a wonderful day! Oooh and I hope the sweet Mrs.Dawbis had an expecially wonderful birthday!!! Hugs to you all and sleep tight. xox=vv. oh cool - i have been reading about this film!